Scapholunate dissociation is the most common and most significant ligamentous injury of the wrist., It results from the relative instability between the Scaphoid and Lunate bones secondary to hyperextension or rupture of the scapholunate ligament and generally presents radiographically as a widened medial-lateral gap between the two carpal bones. The primary MOI is an acute stress load of the wrist in extension and ulnar deviation, leading to a force vector pushing the lunate and scaphoid at an angle to each other instead of transferring force directly through the lunate and scaphoid together. This commonly tears the scapholunate ligament and can cause subsequent ligamentous tears of the radiocapitate, radiotriquetral, and dorsal radiocarpal ligaments respectively with increased force loads. 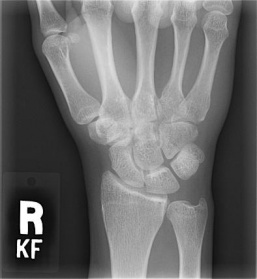 With scapholunate disassociations there are often associated radial styloid fractures (Colles Fracture) or non-displaced scaphoid franctures that must be addressed. The two primary complications due to scapholunate dissociation are Scapholunate Advanced Collapse (SLAC) and general arthritis of the wrist. Both of these lead to increased disability at the wrist, but a SLAC refers to a specific pattern of osteoarthritis and subluxation resulting secondary to an untreated disassociation that can lead to severe disability at the wrist. Volar Wrist Ligaments Used with permission from The Warren Alpert Medical School of Brown University. November 2011. Patients will typically present with pain on the radial side of the wrist, specifically localized to the area over the scaphoid and lunate bones. Complaints may include clicking that causes pain, a report of “giving way,” and decreased grip strength. Details to look for in the patient history include injuries to the wrist that involve hyperextension, or repetitive trauma while the wrist is in extension. Lau et al. give an example of prolonged use of crutches as a type of overuse trauma to the wrist while it is in extension. There are three stages of scapholunate instability. The mildest, occult instability, will typically be due to a FOOSH injury (fall onto outstretched hand), and the patient will have wrist pain, but there will be no visible findings on the radiographs. Watson describes this stage as Pre-Dynamic Instability. The FOOSH injury can cause a tear of the Scapholunate Interosseous Ligament (SLIL) that may or may not progress to a complete tear. The next stage is a complete tear of the SLIL, called Dynamic Scapholunate Instability, and can be diagnosed through imaging. The next stage, Scapholunate Dissociation, is when not only the SLIL is involved, but also the secondary stabilizers are affected. Eventually, this can lead to degenerative changes, and the patient can develop Scapholunate Advanced Collapse (SLAC), and severe arthrosis of the wrist. In determining a diagnosis, it is important to take a careful history, including specific details on how the patient fell onto their hand. Falling onto the hand with the wrist extended and ulnarly deviated are the most likely positions to lead to damage to the SLIL. 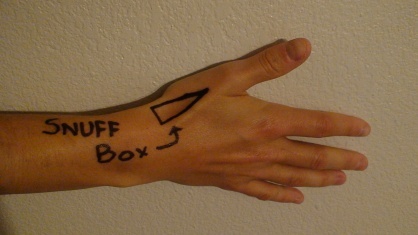 During the physical exam, palpation should also be done over the anatomic snuffbox. Tenderness tends to be at the proximal end of the snuffbox, and just distal to Lister’s tubercle. 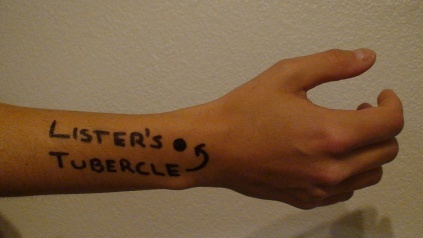 The examiner may also notice a click, or have the patient report the feeling of the wrist “giving way” when pressure is applied over the area. 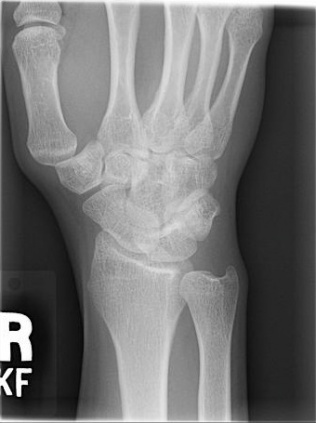 During the acute phase of injury, Scapholunate Dissociation can present similarly to a scaphoid fracture, so it is important that a possible fracture be ruled out. Jacobson MD, Plancher KD, Evaluation of Hand and Wrist Injuries in Athletes. Designed as a provocative test with dorsal subluxation of the proximal scaphoid over the dorsal rim of the radius as wrist is radially deviated. 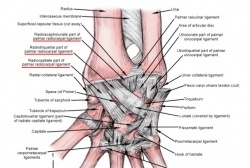 If the scapholunate ligament is disrupted, the scaphoid will tend to flex to the palm of the hand and the lunate will face dorsally on the hand. Positive test: The examiner should feel a significant "clunk" and the pt will experience pain. Used with permission. November 2011. While it is difficult for the medical community to decide on specific surgical interventions, other categorical separations do help feature particular procedures. Factors such as if the injury is acute or chronic, the severity of the separation and to what extent the impairments are affecting the individual all weigh in on how a surgeon decides to proceed. Unfortunately, rehabilitation of SLD has not yet been well researched. As such an impairment based approach is recommended in the acute and chronic phases. It is advised to work closely with the Orthopedic Surgeon for post-surgical patients and patients with symptoms that may benefit from surgery. Acute phase: After ruling out more serious conditions, this condition can be treated as essentially synonymous with an ankle sprain of similar severity. Chronic phase: impairments such as limitations in ROM, poor grip strength as compared bilaterally, and severe pain should be addressed as appropriate. It is recommended that the patient should learn to recognize activities which overstress their wrist and avoid or modify these activities. The use of heating or cooling modalities, including contrast baths, and NSAIDS may be used palliatively during flare-ups. In addition splints may be used to limit the movement of the involved joints. Cadavar studies have also indicated that the Flexor Carpi Radialis may play a role in stabilizing the Scaphoid during movement. Post-surgically: the PT should cooperate with the expressed protocols of the Orthopedic Surgeon. The patient will likely be casted for up to 10 weeks and may accrue significant limitations which can then be addressed in therapy. It has been suggested by Goldberg et al that rehabilitation following a major reconstruction surgery can take 4-6 months until return to activity and 12-15 months until full recovery. Even with a successful surgery it is suggested that the patient may wear a removable Orthosis during particularly strenuous activities. Garcia-Elias M, Lluch AL, Stanley JK. Three-ligament tenodesis for the treatment of scapholunate dissociation: indications and surgical technique. 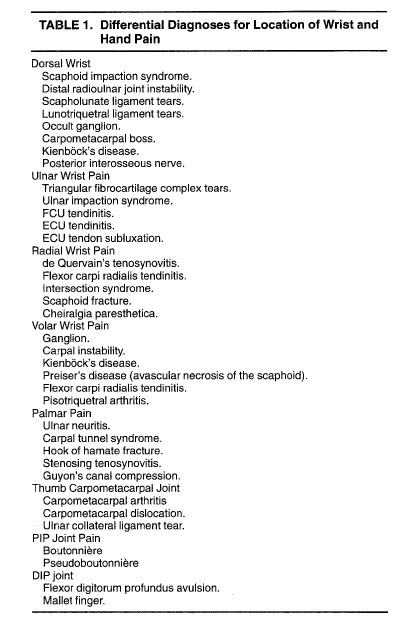 J Hand Surg 2006 Jan;31(1):125–134. Goldberg SH, Strauch RE, Rosenwasser MP. Scapholunate and Lunotriquetral Instability in the Athlete: Diagnosis and Management. Oper Tech Sports Med. 2006;14:108-121. SLD is a very common complication of FOOSH type injuries and is equally commonly undiscovered. There are several secondary complications such as SLAC or arthritis which may not appear until many years after the initial insult. The most well researched treatment option for SLD is surgical repair, but a commonly agreed upon surgical approach has not yet been identified. PT management of the condition should be considered impairment based according to the specific stage and severity of the patient presentation. ↑ 1.0 1.1 1.2 1.3 Duke Orthopaedics: Wheeless' Textbook of Orthopaedics. http://www.wheelessonline.com/ortho/scapholunate_instability (accessed 15 October 2011). ↑ Moran SL, Cooney WP, Berger RA, Strickland J. Capsulodesis for the treatment of chronic scapholunate instability. J Hand Surg Am. 2005 Jan;30(1):16-23. ↑ 3.0 3.1 Duke Orthopaedics: Wheeless' Textbook of Orthopaedics. http://www.wheelessonline.com/ortho/scapholunate_advanced_collapse_slac. (Accesed 15 October 2011). ↑ The Warren Alpert Medical School of Brown University. http://brown.edu/academics/medical/. Permission to access granted November 2011. ↑ 5.0 5.1 5.2 5.3 5.4 Lau S, Swarna SS and Tamvakopoulos GS. Scapholunate dissociation: an overview of the clinical entity and current treatment options. Eur J of Ortho Surgery & Trauma. 2009 Mar;19(6):377-385. ↑ J. C. MacDermid, “The patient-rated wrist evaluation (prwe) user manual,”fckLRDecember 2007. ↑ 9.0 9.1 Opreanu R, Baulch M, Katranji A. Reduction and maintenance of scapholunate dissociation using the TwinFix screw. Eplasty [serial online]. 2009;9:e7. Available from: MEDLINE with Full Text, Ipswich, MA. http://web.ebscohost.com/ehost/detail?vid=6&hid=19&sid=e64f9dff-7c61-4990-ab69-8ae0a2b413a3%40sessionmgr115&bdata=JnNpdGU9ZWhvc3QtbGl2ZQ%3d%3d Accessed November 26, 2011. ↑ Watson's Test. http://en.wikipedia.org/wiki/Watson%27s_test. (accessed 24 October 2011). ↑ Akahane M, Ono H, Nakamura T, Kawamura K, Takakura Y. Static scapholunate dissociation diagnosed by scapholunate gap view in wrists with or without distal radius fractures. Hand Surgery: An International Journal Devoted To Hand And Upper Limb Surgery And related Research: Journal Of The Asia-Pacific Federation of Societies For Surgery Of The Hand [serial online]. December 2002;7(2):191-195. Available from: MEDLINE with Full Text, Ipswich, MA. http://web.ebscohost.com/ehost/detail?vid=8&hid=19&sid=e64f9dff-7c61-4990-ab69-8ae0a2b413a3%40sessionmgr115&bdata=JnNpdGU9ZWhvc3QtbGl2ZQ%3d%3d#db=cmedm&AN=12596278 Accessed November 26, 2011. ↑ 12.0 12.1 Garcia-Elias M, Lluch AL, Stanley JK. Three-ligament tenodesis for the treatment of scapholunate dissociation: indications and surgical technique. J Hand Surg 2006 Jan;31(1):125–134. ↑ 13.0 13.1 Caloia M, Caloia H and Pereira E. Arthroscopic Scapholunate Joint Reduction. Is an Effective Treatment for Irreparable Scapholunate Ligament Tears? Clin Orthop Relat Res. 2011 July. http://www.springerlink.com.libproxy.txstate.edu/content/t748g05668214081/fulltext.pdf Accessed: November 27th, 2011. ↑ 14.0 14.1 14.2 Capele A, et al. Mayo Clinic Health Letter - Tools for Healthier Lives. 2011;29(1):1-3. Mayo Foundation for Medical Education and Research, 200 first St. SW, Rochester, MN 55905.http://www.businesswire.com/news/home/20110117005129/en/Mayo-Clinic-Health-Letter-January-2011-Reducing Accessed: November 27th, 2011. ↑ Salva-Coll G, et al. The Role of the Flexor Carpi Radialis Muscle in Scapholunate Instability. Jnl Hand Surg – Am Vol. 2011;36A:31-36. Serial online. http://apps.webofknowledge.com.libproxy.txstate.edu/summary.do?SID=4AGo4bcBFcKHjC3AGbl&product=UA&qid=3&search_mode=GeneralSearch Accessed: November 28th, 2011. ↑ 16.0 16.1 16.2 Goldberg SH, Strauch RE, Rosenwasser MP. Scapholunate and Lunotriquetral Instability in the Athlete: Diagnosis and Management. Oper Tech Sports Med. 2006;14:108-121. http://www.sciencedirect.com.libproxy.txstate.edu/science/article/pii/S1060187206000402 Accessed: November 27th, 2011.